Sometimes it's unclear where the garnish ends and the buffet table begins. 1. This Bloody Mary is a 'meat and potatoes' kind of girl. Waffle fries, bacon, and salami, that is. Recipe here. 2. This Bloody Mary is all about the appetizer sampler. Served at The Nook in Atlanta, GA.
3. This Bloody Mary is so intensely garnished, you need a beer to wash her down. Served at Sobelman's in Milwaukee, WI. 4. This Bloody Mary got cold and reached for a cheese blanket. 5. This Bloody Mary has seriously expensive taste. King crab claws? Upward of $35 per pound. Recipe: The Ultimate Bloody Mary. 6. This Bloody Mary is a "Tailgate in a Glass." It's made with beef jerky-infused vodka and "mud" horseradish sauce (? ), and it's served at Parlor Sports in Sommerville, MA. 7. This Bloody Mary loves a good crawfish boil. 8. This Bloody Mary seems a little fishy. That's a whole smoked chub peeking out. Served at The Cove in Traverse City, MI. 9. This Bloody Mary is garnished with a beef slider and a lamb slider. Served at Hotel Madeline in Telluride, CO.
10. This Bloody Mary pays tribute to the Milwaukee Brewers by defying gravity. Also by encouraging binge-eating. The Brewers Bloody Mary is served at O'Davey's Pub in Fon Du Lac, WI. 11. This Bloody Mary is always trying to one-up her friend. After Thrillist caught wind of the Brewers Bloody Mary (#9, above), they challenged its creator, bartender Sarah Jayne Pickart, to outdo herself. And, she delivered. Garnishes are too plentiful to list here, but highlights include a triple decker fish sandwich—walleye, perch, and bluegill, which PIckart caught herself—a venison stick, and a bacon-wrapped jalpeño popper. Read more here. 12. This Bloody Mary is southern to the core. There's no better way to wake up than biscuits, booze, and some chicken and waffles for good measure. 13. This Bloody Mary knows how to shotgun. 14. This Bloody Mary feels like chicken tonight. Like, an entire roast chicken. Plus buffallo wings, burgers, potatoes and a brownie. Served at Score on Davie in Vancouver, BC. 15. 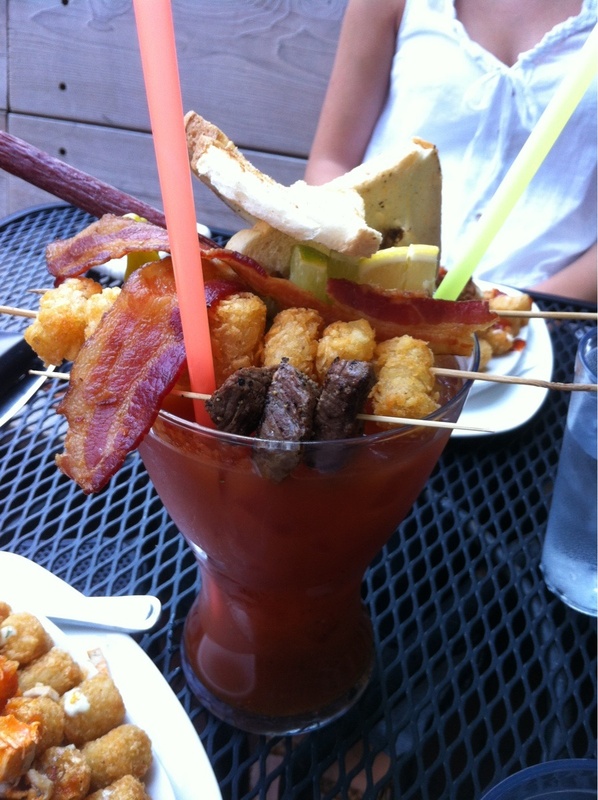 This Bloody Mary's got a meat-rub rim and a rib on top. And, on Sunday it's only $6 at That Boy Good in Oceanside, CA. 16. This Bloody Mary eats pizza for breakfast. 17. This Bloody Mary has a meat straw. Face it, tomato juice is better when it tastes faintly of Slim Jim. Get Benny's Beef Straws here. 18. This Bloody Mary hooked up with pizza, a footlong sub, and another Bloody Mary at the same time. Also fries, fried chicken, onion rings, and a whole lot of other stuff. It was created (well, assembled) by comedian Randy Liedtke, and you can read the details here. 19. This Bloody Mary will never be too good for string cheese. Frankly, neither will I. Served at Revere's in Delafield, WI. 20. This Bloody Mary is obviously from England. The whole 'beans on toast' thing never quite made it on this side of the pond. 21. This Bloody Mary needs to get shucked. Good thing oysters and Bloody Marys are perfect for each other. Recipe here.